Hala! Thanks for the heads up Shayne! Kaya pala wala pang nag eenter hehe. Updated the post. Ooh thanks for the recommendation! I’ll check these out! What nail polish brand would you recommend and why? 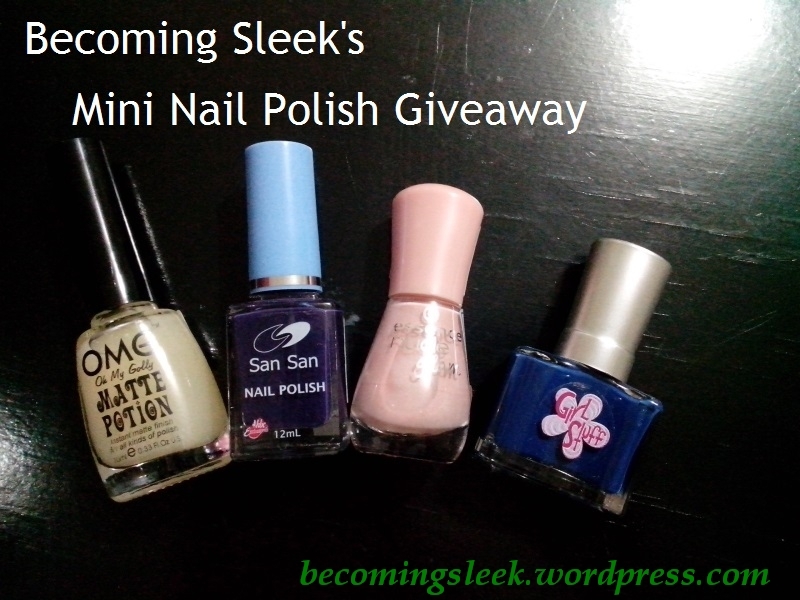 – I love THE FACE SHOP nail polishes… the ones I have last for years. The oldest one is already 5 years, would you believe that? I haven’t bought any high-end (OPI, China Glaze, etc) because I’m not big on investing on nail polishes. I do, however, buy Bobbie, Chic, OMG, and Caronia. They come in a variety of colors but they dry out… FAST! I also have a couple of Victoria Secret and LA Colors nail polishes. Nothing really extraordinary, IMHO. Yeah I discovered the drying out of the cheaper brands and it’s sad. 🙁 I haven’t tried TFS nail polish yet, thanks for the recommendation! Honestly I haven’t tried any nail polishes for years already,the only brand I knew way back then is the Caronia,my mother used this always.I hope I win so I’ll give them to my mother! I love San San too! Thanks for the recommendations! I would recommend dazzle dry. It dries in 5 minutes plus its safe to use. it wont make your nails color yellow. THE FACE SHOP nail polishes is sooo good,try it. I should really try these. Thanks for the recommendation! I used to not care about polishes but once I tried high end (like China Glaze) you really get why they charge so much. It’s waaaay easier to even out and applies so opaque! There really is a big difference, and it was fun to discover those. I’d really like to try all the main brands at least once, so I can experience how it all differs.